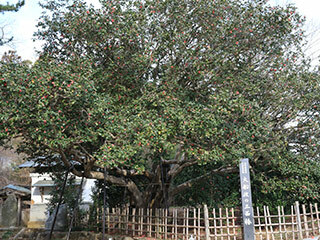 Sanmen Camellia (三面椿) is the oldest and largest Caellia in Japan. It is located in Kumano Shrine, Ofunato, Iwate prefecture. It is about 1400 years old Camellia. It survived from Tsunami 2011. It is 8m round and 17m tall. Camellia blooms in late March. 1. use Local Bus to Goishikaiganguchi. Sanmen Camellia is oldest and largest Camellia in Japan. It is located in Kumano Shrine. Sanmen means three faces. It was planted when this shrine was established for 3 different dirrections.